The Gray Report: Restaurant secret: Guess what they're adding to your Champagne? Restaurant secret: Guess what they're adding to your Champagne? Do you ever order a glass of Champagne in restaurants? I do. You know what they might be adding to it? I learned this recently from someone who has been spending a lot of time working with restaurants on their wine by-the-glass programs in more than one part of the country, though that person believes New York is the epicenter of it. The reason is this: very few restaurants have a good preservation system for Champagne. A bottle opened at 6 pm might not appear to have much fizz left at 8:30 pm. Adding a touch of sugar just before serving -- less than the size of the packets used for coffee -- causes the Champagne to fizz up. It looks festive, and the customer can't complain that the wine has gone flat, no matter how it tastes. Try it at home: it works. There's a reason no news organization has done an investigation of this practice, which is widely known among restaurant people: it's not harmful. Almost all sparkling wine has residual sugar anyway, so it's not a case where a diabetic would unknowingly face a health risk. A packet of sugar contains about 4 grams of sugar, for about 16 calories. The only thing at risk is the taste of the Champagne. 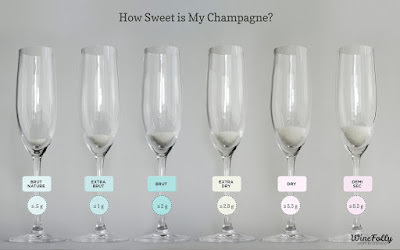 A glass of Brut Champagne might have, on average, about 2 grams of residual sugar. 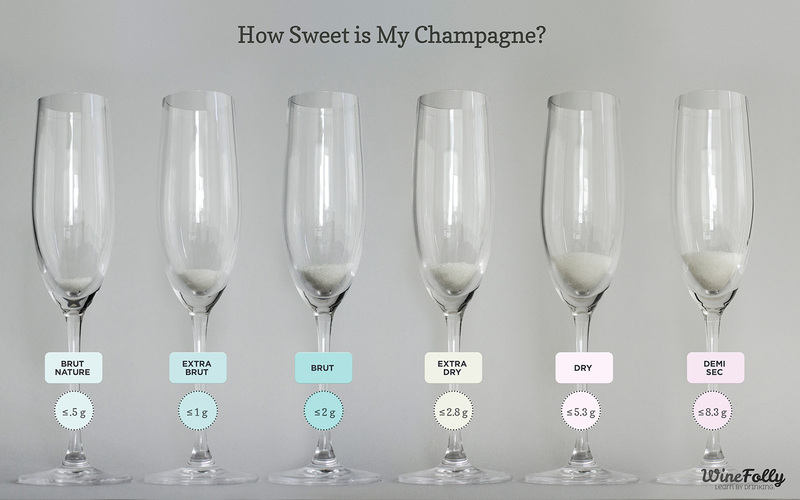 Adding half a packet of sugar to freshen up the bubbles doubles the sugar content, making it sweeter than a glass of Extra Dry Champagne. The 2 extra grams of sugar won't kill you: try asking the chef how much butter and salt is in your appetizer. But if you ever thought the Champagne you ordered tasted a little sweeter than you expected, now you know why. This is very surprising, because I find Champagne and other sparkling wines among the easiest wines to preserve. We have several different caps that we've picked up from sparkling wine producers in France, and they all work very well. The sparkling wine keeps its fizz for at least a couple of days (although it rarely lasts that long). Bob: I agree that it's true at home, but I think it's different in a restaurant, where everyone is moving fast and not concentrating on carefully recapping the bottle. I do see your point Blake. Agreed, it's tough to ensure that the bubbles are properly capped all the time. We serve a lot of bubbles, from Prosecco to bone fide Champagne. even by the glass. We the volunteers enjoy what remains of any open bubbly post-shift, since it can't be served the following day. I think you are being too forgiving when you state: ". . . I think it's different in a restaurant, where everyone is moving fast and not concentrating on carefully recapping the bottle." Anybody who handles bottles of wine in a restaurant or wine bar has a duty to protect the assets of the establishment (e.g., open bottles not going to waste). and to provide the best experience for the drinking/dining customers. That's their job to ensure the sparkling wine isn't flat. No less than the responsibility of serving the food at the right temperature. I don't know Gray. I've been working in restaurants for about 15 years, I've had most FOH positions: server, bartender, Somm, manager etc... I've seen this done once and it was in the beginning of my career, more than 10 years ago. The guy that did was an old school manager and told me he was going to show me " an old trick of the trade" . It was at a brunch place that served bottomless sparkles; lady had complained that her wine was flat ( it wasn't). I think this is probably either a really old school practice or maybe something they do mostly in the East Coast like you said, Nobody really does this in SF, at least on my experience. Years ago, I was on a business trip to Indianapolis for a convention. I did some research before departing, and identified St. Elmo's Steak House as a Wine Spectator magazine award-winning restaurant for its wine list. One late afternoon I slipped away from the convention to have an early dinner. I pulled up a stool at the bar, perused their wines-by-the-glass list, saw they had (Saintsbury?) Pinot Noir, and order it. One taste and it was clear the bottle had oxidized overnight. No Vacu-Vin. No Wine Preserve gas. No effort whatsoever to protect the freshness of the open bottle. I called the bartender over, explained my disappointing experience, and asked him to open a new bottle in my presence. I can't ascribe "benign ignorance" on handling wine to the bartender or the dining establishment. As I commented above, every employee has a duty to protect the assets of the establishment (e.g., open bottles not going to waste), and to provide the best experience for the drinking/dining customers. I voted with my wallet and my feet and never came back.